Victron Energy, a leading power solutions provider, on June this year introduced four new models to their ultra-fast BlueSolar charge controller (MPPT) range. The series now comprises eight models, ranging from the BlueSolar MPPT 75/15 up to the new BlueSolar MPPT 150/85. The new models are the BlueSolar MPPT 100/30, BlueSolar MPPT 100/50, BlueSolar MPPT 150/35 and BlueSolar MPPT 150/85. In expanding the range, Victron have increased customer choice and further enhanced the ideal matching of solar charge controllers for any given system. Some of the key features which enable this are: automatic battery voltage recognition, intelligent battery management by load shedding, ultra-fast response times to solar irradiance and multi stage charging algorithms. Whilst BlueSolar MPPTs (like other major manufacturers) allow solar modules to be placed in series as well as parallel to increase input power; Victron MPPTs are unique in having solar power limiting built in, which ensures the output power of a system will never exceed the maximum rating of the controller. This special feature of the Victron BlueSolar MPPT range allows customers to connect a surplus of nameplate solar power. Furthermore Victron provide an essential spreadsheet tool to ensure the best possible choice of controller. 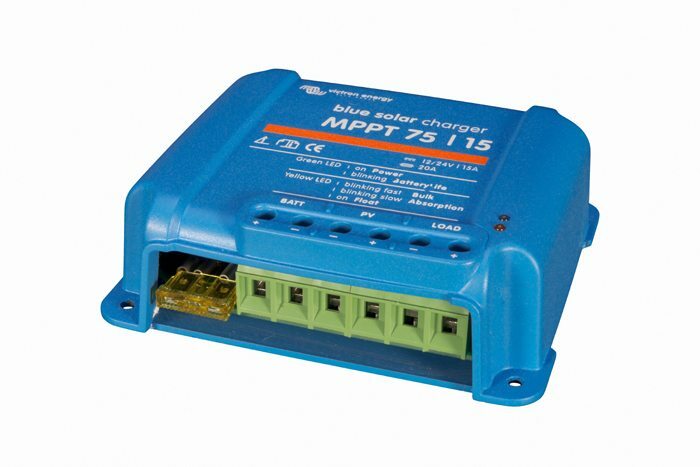 This is available and explained in the blog post ‘Matching solar modules to MPPT charge controllers’. This tool will assist in purchasing the best fit controller, whether that is to save on cost or to use a larger controller from the outset, if planning for the future expansion of an installation. Monitoring a system is also key to maximizing the return on investment. All BlueSolar MPPT charge controllers can easily be monitored and controlled using the Victron Color Control GX. In addition and to enable users to monitor and manage their installations from anywhere in the world, Victron Energy offers their award winning Victron Remote Management portal (VRM) free of charge. This is accessed via a web browser or a free mobile/iPad app, where a wealth of system data and enhanced options are available.